The Oldest Population Structure of All in Southern Africa? Southern Africa is kind of a big deal. Not because it is the seat of human origins; I am beginning to think that question is “not even wrong.” Nor because it contains the “oldest human population” in the world; we are all the oldest human population in the world. Rather, the genetic variation one can find across a small region in southern Africa is incredible, and, it is one of the few regions of the world where hunter-gatherers have persisted in a culturally pristine fashion. By this, I mean that there is no evidence that the hunter-gatherers of southern Africa practiced another way of life (i.e., that they are marginalized agriculturalists or nomads), or, that their language was adopted from agriculturalists (as is the case with the Pygmies of central Africa). In other words, the continuity of the peoples of southern Africa is more notable not for their genetics, but their culture. That being said, the cultural conditions under which the KhoeSan peoples existed are of genetic interest, because their high degree of variation may reflect aspects of population dynamics common to hunter-gatherers as a whole. In light of all this a new preprint on bioarxiv is quite interesting, Fine-scale human population structure in southern Africa reflects ecological boundaries. The title rather says it all, but I’ll admit that it’s hard to keep track of all the populations. It certainly strikes me as plausible, as the genetics suggests that there’s a lot of structure that built up over the years. Of note: “To contrast this with Europeans, the ≠Khomani and the Ju/’hoansi may have diverged over 30,000 ya but live only 1,000 km apart, roughly the equivalent distance between Switzerland and Denmark whose populations have little genetic divergence.” They report trans-Kalahari F st values on the order of 0.05, which is quite high, on an order of magnitude or so greater than what can be found in Northern Europe. But the latter is more comprehensible when you consider the genetic character of the North European plain only arrived at its current state ~4,000 years ago. Since the above is a preprint, some critiques are in order. The authors use ancestry tract lengths to assess admixture of Bantu, Asian, and European, elements into the KhoeSan. The implication is that these were separate admixture events. Some of them certainly were. 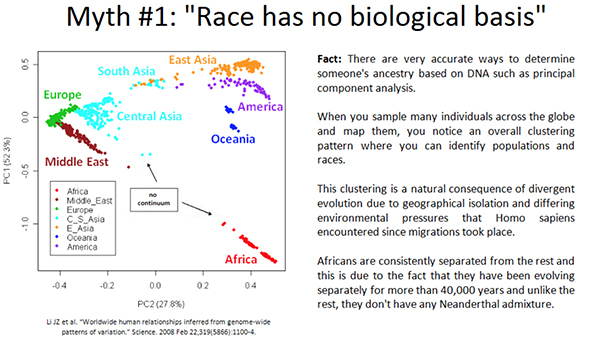 But I’m a little skeptical of the power of these methods to distinguish admixture between the last two non-African components (also, I think it is probably advised for a population genetics paper to dispense with the cultural construct of Asian and make the clear distinction between South and East Asians, since the former are often genetically closer to Europeans, and this previously inflated the European proportion among Cape Coloureds). 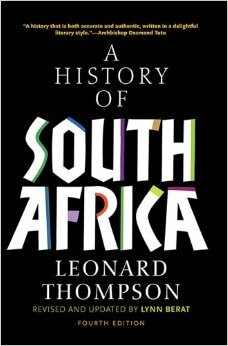 It’s been many years since I read A History of South Africa, but one of the more interesting aspects that I recall from this book was the cultural distinctiveness of what has now come to be called the Cape Coloured people, and their role as mediators along a fluid cultural frontier with the KhoeSan people. The history of the Griqua in particular shed light on how one might imagine European and Asian (South and East) ancestry arrived into the KhoeSan. 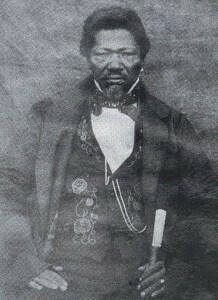 Though racially mixed, the Griqua resembled the Dutch in formal and institutional aspects of their culture by the 19th century. But, as a semi-nomadic and pastoralist group they also had affinities with their African neighbors (and often, they played the role of predators with the Africans and their herds), with whom they clearly shared ancestry. It was not an unknown phenomenon to have Griqua scouts “go home to their mother’s people.” Even if their literal mother was also a Griqua, they seem to have had a sense that their maternal ancestors were invariably non-European, and often derived from the KhoeSan (many Griqua still spoke the now extinct Cape Khoi language, though they were shifting toward a Dutch Creole). The probability of assimilation of unadmixed Europeans, South Asians, and East Asians, into KhoeSan groups is not zero, but it strikes me as quite low. On the other hand, Griqua, who were mixed between all the populations of southern Africa, and culturally quite at home in the semi-desert wilderness, seem ideal candidates for the population which could serve as the vectors for transmission of these ancestral elements into the KhoeSan. A second issue with this preprint is that I’d like to see more methods. E.g., three and four-population tests and TreeMix in particular, since with 320,000 SNPs these should be totally feasible with genotype data. These are not groups that most people have much familiar with, so PCA and ADMIXTURE tend to overwhelm. To develop a decent intuition about what’s going on trees and tables are often helpful (I don’t like tables usually, but often when you are focusing on a finite number of populations per row they can allow for greater focus). Also, there are now interesting ways to analyze spatial genetics beyond Mantel tests. Ultimately these results confirm what I already held as a prior. 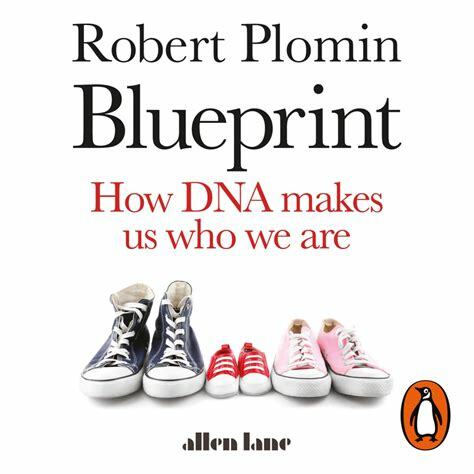 It strikes me that the relationship we see between language and genes today is largely a function of the reality that much of the population genetic structure we see around us is a recent phenomenon. That is, massive migrations due to cultural changes (e.g., agriculture) were accompanied by both language and genes, and only a few thousand years are simply not enough time to allow for linguistic differentiation to obscure common origins. 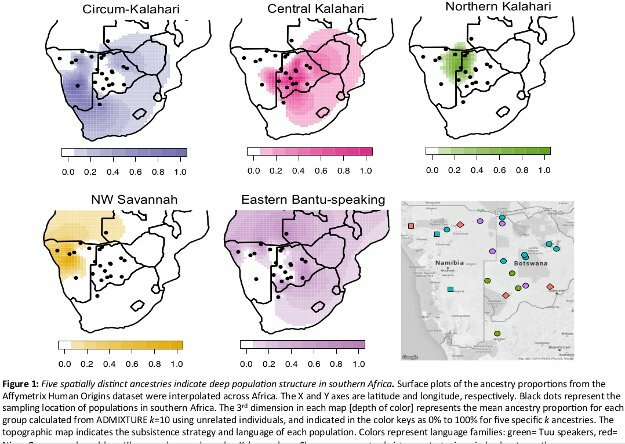 In contrast, if, as seems plausible, many of the KhoeSan people were resident in southern Africa for tens of thousands of years, then correlations between language and genes should slowly decouple (in part because deep linguistic affinities may not be discernible). That being said, I would not be surprised if ancient DNA from southern Africa at some point overturns conventional wisdom that these peoples are truly primal…. 14 Comments to "The Oldest Population Structure of All in Southern Africa?" I often use today’s world as clue for the past. So many people with distinct genetic background use English as the first language (Singapore, Malta, more). Irish and Dutch are virtual English speakers. Language can be changed very fast and easily. Late Mongolian, Manchurian and many other Non-han rulers often could not speak their native language anymore. In my opinion, language is least reliable method to analyze ancestry. Human were mostly adapted to their environments instead of changing environment. It is much harder to change natural environment than human behavior modification. No body can change dry desert with natural low precipitation in regions like horse latitudes. It is no surprise that former farmers returned to hunter-gatherer or nomad life style due to migration or environmental change. Or vis visa, that nomads turn into farming when they have fertile land. Again, way of life is very much environmentally dependent. Only after very long stable life in specifice environment, genetic change happens like AMY1 copies or lactase persistence. Your vice versa case of nomads turning to farming would have to have been much rarer. After all, acquiring the skills for farming would be hard compared with just doing what nomads do all the time, namely move from one environment to another. By this, I mean that there is no evidence that the hunter-gatherers of southern Africa practiced another way of life (i.e., that they are marginalized agriculturalists or nomads), or, that their language was adopted from agriculturalists (as is the case with the Pygmies of central Africa). The hunter gather mode of existence and not primal ancestry would be responsible for the physical characteristics that led observers to suggest Bushmen were a step between chimpanzees and humans or a completely different line of descent to Europeans. In 1837 Darwin spent time with a what were then called Hottentot (stutterer) guide he hired and was of the opinion he was quite comparable to a European . Darwin described the Bushmen as “like bleached negros”. Bushman couples need to work hard to obtain suficient food , see here, yet they are vulnerable to sunburn (Silberbauer 1981). Darwin was in no doubt as to the significance of Steatopygia in Bushmen females, there are also other peculiarities. That being said, I would not be surprised if ancient DNA from southern Africa at some point overturns conventional wisdom that these peoples are truly primal…. Some characteristics may be recent adaptations (skin lightening and reduction in size for example), but Bushmen would seem to be the best example of ‘primal’ in the sense of Africans long selected as hunter gatherers. The https://en.wikipedia.org/wiki/Venus_figurines have similarities to Bushmen females ; it bears repeating they are the only known Africans who have always been hunter gathers. The other Sub Saharan Africans (Black Africans) may owe their particular characteristics to selection in an agricultural mode of existence; maybe they started off as a population with an appearance similar to KhoeSan . You be very careful you don’t upset sensitive souls in Oz Razib. You should know that the First Australians (sic – embarrassing rhetoric of course. DNA is only just beginning to tell what remnants from early migrations and castaways may be left and who may have slaughtered whom) have “the world’s oldest living [or continuous] culture”. Forget about African pygmies and Khoi San people our Aussies are older and what’s more than they didn’t learn or change a thing as they hugged the south Asian littoral while learning to fish and to row and sail boats so they could escape the snakes and tigers in the jungles. I often use today's world as clue for the past. So many people with distinct genetic background use English as the first language (Singapore, Malta, more). Irish and Dutch are virtual English speakers. Language can be changed very fast and easily. Late Mongolian, Manchurian and many other Non-han rulers often could not speak their native language anymore. In my opinion, language is least reliable method to analyze ancestry. Maybe, but it still happens in our recent history. I will give you one example: Mongolian. Mongol ancestor originated further north of current Mongolia territory as Hunter-gatherer. After predecessors on mongolia steppe left (complicated history), mongol moved in to fill the empty land and picked up skill as nomads like its predecessors. Later even before Genghis Khan was born, some Mongolians already started to become farmers on the Mongol steppe.With progressing of history, most Mongolians living in inner Mongolia are farmers now just like their Han neighbors. The romantic version of Mongolian on horse back are minority now. I personally have Mongolian friends whose family living in inner mongolia as farmers. These people even do not speak any Han Chinese. They only learned Han or Mandarin in school and college. In a way, you can say they are pure Mongolian without any Han influence. Pure mongolian villagers live their live just like regular farmers. Unless too stupid to learn, most people are able to learn to become farmers. If traveling the world, you will notice that land condition determines its economy. Fertile land like USA midwest is for farming. Bad land like Nevada is only good for pasture. Mongolian can learn it from nearby Han Chinese people but on condition that land is good enough for farming. It is true that most Mongolia land is too poor for farming. But there are always area good enough for farming, especially in inner mongolia. The predecessors before mongolia had very much assimilated into Han Chinese farmers. They only existed as historical notes now. These people were Xiongnu, Jie, Xianbei, Di, and Qiang. In China, recent history has shown repeated sinicization of northern nomads/hunter-gatherers ( Xiongnu, Jie, Xianbei, Di, and Qiang) in northern agriculture region. Each time, it is mixture process with northern tribes. With right environment for agriculture (more productive than nomads steppe), every body become farmers as you can observe in USA, Peru ect. Mongolian are good example of people in transition with both hunter-gatherer, nomads, farmers present currently. Mongolian farmers are majority now. There was even preservation effort by Qing dynasty to keep traditional Mongolian nomad life styel. At end, people are smart enough to figure out that more money can be made on fertile land as farmers. No body can stop that (in pursuit of wealth). Thanks. Interesting. For contrasting interactions with the environment you could look at southern Sri Lanka where easy abundance and not natural terrotrs apart from a tsunami every 100 years or so is conducive to laziness. "land condition determines its economy." A best, this is a partial truth. Even areas that a very productive agricultural land today, were not before they were transformed by human agency. Flood plains can be excellent agricultural lands. But, many of those areas were malaria swamps before they were drained. In the US, lands in the valleys of the Mississippi, Missouri, and Ohio rivers, needed draining, and massive flood control works before they could become agriculturally productive. You mention Peru. Without the manufacture of terraces, agriculture would have been unremunerative. Furthermore, the beginnings of civilization can be traced to the efforts of the inhabitants of the Mesopotamia, and Egypt to irrigate and control flooding. While it is true that there are places where the effort to make land productive for agriculture is too extreme to justify the effort, there are even fewer places where no human agency is required. Agricultural land is a product of human agency, and does not exist prior to or without it. Maybe relevant here, because it showed haplotype structure between a set of East African populations who do not seem to have increased haplotype overlap with Eurasians, and a set of West African populations, which was comparable in size as that between East and West Eurasians (measured by a variable TVD – total variation difference). This in spite of lower FSTs between these East and West African sets compared to the Eurasian groups. It would have been interesting to see those measures applied to these groups (if possible). I still find it very interesting that what some consider "au naturel virgin" woodlands have, on closer study, turn out to have been tweeked by HG types for many generations to skew in the productive direction that they desire. I would not expect other apes develop agriculture any time soon. Fascinating. Apropos of not much, I just read where New Guinea, an island of about 300k square miles and populated primarily by hunter-gatherers, has about 1, 200 different languages. Yes, it is supposed to be down to a potentiating effect on group selection. I read where one NG tribe fellow went away for short trip and returned to find the verbs had all been changed, thus differentiating the village from the dialect of near neighbours (the nearest village being natural enemies presumably). I still find it very interesting that what some consider “au naturel virgin” woodlands have, on closer study, turn out to have been tweeked by HG types for many generations to skew in the productive direction that they desire. On top of that, even human demonstrated different agricultural productivity/efficiency. It is no surprise that European farmers are more productive than Native American semi farmer/hunter-gatherers. It is also no surprise, for the same piece of land, that Han farmers are more productive than Mongolian/Manchurian who are only recently becoming farmers. The ability to plan, seeds research, calculate, timing the season/weather, predict market have a lot to do with farmer productivity. Some of this ability might become genetic if people have engaged in farming over very long time. Ability to math helps a lot. According to Alan Greenspan, Chinese farmers productivity is 2 times that of vietnamese farmers, 3 times of Indian farmers. This innate ability to farm is more to do with the person than the land. It is no surprise that Chinese farmers currently rent farm land in southeast asia due to this high productivity. Productive farmers can afford higher lease and still very profitable for self. As farm owner, I also offer my land to the American farmer who can pay higher lease in the market. A competent farmer can out bit the incompetent ones. Market economy is for the survival of the fittest. Historically land lords just like any business owners only care more for people's productivity than people's tribal background. As farm owner, I also offer my land to the American farmer who can pay higher lease in the market. A competent farmer can out bit the incompetent ones. Market economy is for the survival of the fittest. Historically land lords just like any business owners only care more for people’s productivity than people’s tribal background.